A Junk-Foodaholic's Journey to a Healthy Lifestyle: If Vacations Are For Resting, Why Am I So Tired? If Vacations Are For Resting, Why Am I So Tired? We had a wonderful vacation in Eastern North Carolina, but it's always good to be home. Our little toddler, Brady, was a trooper on the airplane. On the way to North Carolina, he was super-hyped up, which kept him from sleeping. But thank the Lord... he did sleep on both legs of the flight back home. Running around after Brady kept me from being able to lay out by the pool or on the beach (insert lots of sympathy here). Brady had a blast playing on the beach the first day. But after he gulped down some salt water, he decided to stay out of that salty-wet-stuff altogether! 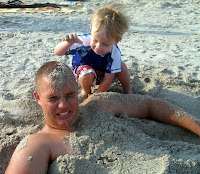 The thing Brady enjoyed most about the beach was burying his big brother, Dylan, in the sand. Brady didn't think much of the swimming pool either. Every time we tried to get him in the pool, he thought the water was too cold. Paul finally took him into the pool, but with all the fussing and crying, we decided it wasn't worth it. Brady liked being pool-side so he could push his brother and cousins into the pool. Staying at the condo was, of course, the highlight of the entire beach trip. 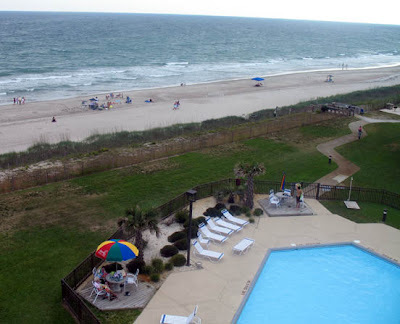 Everyone loved the convenience of being able to come and go to the beach or pool as often as we wanted. And you can be sure none of us wanted to leave Thursday morning! Now, more than ever, I want a beach condo when I grow up! My favorite part of the beach trip was the hour we spent scooter-pootin' around Morehead City. I love that little town! It was fun looking at all the beach houses. We also drove to the house where my husband, Paul, lived when he was about 3 years old. 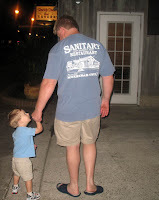 We went out on the town Tuesday night and had seafood at the waterfront Sanitary Restaurant in Atlantic Beach. We went to Sanitary last summer and decided to make a return trip. No one was disappointed. Yum! After buying a couple T-shirts, we went for a walk along the waterfront and let the kiddos run around. On Wednesday, we took the kids to nearby Fort Macon. You can watch a short news video about Fort Macon here. From the top of the fort, you can see the ocean. The view is absolutely beautiful! It's the best state park I've ever visited. You can take a tour of the fort and afterwards enjoy some time on the beach! After leaving Fort Macon, we went back to the condo for some lunch. Later that afternoon, Paul's first-cousin, Susan, came for a visit. She lives in Raleigh and it was neat getting to meet her - she's a real sweetie. For dinner, we all went to Jordan's, in Emerald Isle. Though the restaurant is nothing particular to look at, the food is good. This was our second visit to Jordan's. The first time we ate there was a couple years ago, when we stayed at the beach condo around Christmas. Thursday morning, we left the beach condo. 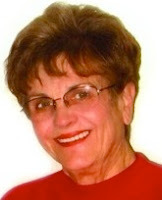 Paul's mama left in her car with our nephew and niece and headed back to Rocky Mount. Paul, Dylan, Brady, and I left in our borrowed car (thanks again, Butch!) and headed to Greenville. We'd only been on the road for about 30 minutes when Paul got pulled over by a state trooper. He wasn't speeding so we figured the car must have a tail-light out or something. The trooper said he'd pulled Paul over because he was not wearing a seat belt. Paul was wearing a seat belt but he always keeps it under his arm for more comfort. The trooper explained to Paul that according to North Carolina law, you can't wear a seat belt that way and he was going to issue a citation. To tell you I was angry is an understatement. I was boiling! When the trooper handed Paul the ticket and told him that the fine would be $100.00 I thought I would come unglued. Paul remained calm and told the trooper that he has not received a ticket in over ten years and asked why he was ticketing 'one of the good guys'. I, however, was not calm. I was yelling at the trooper saying, "This isn't right! I can't believe you're doing this! Thanks a LOT!" I have never been that angry with a policeman before in my life. I think the reason is because I have always deserved every ticket I've received. This incident just felt like pure harrassment. It was a tough thing to get over (we're still irritated about it) but Paul now wears his seat belt in the law-abiding way. On the way back to Rocky Mount (my hubby's hometown), we made a stop at Greenville to have lunch at B's Barbecue. Unfortunately, they had run out of their famous barbecue, so we decided to get a cheese steak at Cubbie's instead. They've got the 'good ice', which is always a winner in my book! After lunch, we stopped by East Carolina University, my husband's alma mater. We went inside the college bookstore to browse around. We were in line to pay for the T-shirts, when Paul came up to me with Brady in tow, wearing an ECU 'adult-sized' football helmet! You kind of need to know the background here. See, Brady LOVES football. He talks about football all the time, wants to 'play' football in the living room every chance he gets. Nine times out of ten, he would rather watch football movies (Rudy, Radio, Facing The Giants, and The Waterboy) than watch iCarly, Thomas the Train or Yo Gabba Gabba! He's only 2 years old! Can you believe a 2-year old can be nuts about football? Well, he is! At home, Brady takes his sister's bike helmet and turns it around and puts it on his head. He then wants his sissy to put the other bike helmet on her head and play football with him. Once we got back to Rocky Mount, we unpacked the car and then just hung out at Paul's Mama's house, relaxing. Around 11 o'clock that evening, Paul and I slipped out to his Mom's restaurant, The Hunter Hill Cafe', to work on the menu. It had been about a year since I worked on it last, and her menu needed to be updated. If you happen to ever cruise through Rocky Mount, check it out! She serves delicious food, cafeteria-style. Our favorite food at The Hunter Hill Cafe' is their scrumptious Eastern North Carolina barbecue! Yum! On Friday (our last full day in North Carolina), we hung out at the house and got everything packed and ready for our early Saturday morning departure. Saturday, we left the house a little after 7:00 a.m. and arrived at the Raleigh/Durham airport an hour later. Our departing flight was about an hour late, but since we had such a long lay-over in Dallas, it didn't matter. Once we arrived at the DFW airport, we had lunch and then took Dylan to his gate. He flew from Dallas to Houston to spend a week with his dad. Then Paul, Brady, and I found our gate and waited for the flight to Little Rock. We finally got home around 5:30 p.m. It was a long day and we were tired, but Paul and I both agreed it was much better than a 17-hour road trip! On Sunday afternoon, Paul, Brady, and I took a four-hour nap! When I woke up, it felt like I'd been asleep about an hour. Hahahaha! I still can't believe it. Anyway, it feels good to be home. What did I miss most? My pillow - most definitely! Monday morning, Paul, Brady, and I left the house at 5:15 a.m. to get Brady to Arkansas Children's Hospital for surgery. Brady was born with small preauricular pits in both ears. On his right ear, he also had a pit located on his outer ear lobe. Brady was also born with a branchial cleft sinus (a hole in his neck). Apparently, all these anomalies happened during the 5th week of gestation. Brady had the branchial cleft sinus removed when he was four months old. Dr. Bower told us he didn't think any of the ear pits would need to be removed but that he would keep an eye on them. 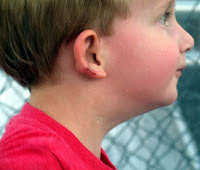 Well, the pit on Brady's right earlobe got infected and after a doctor examination, we all agreed the pit should be removed. The surgery went exceptionally well and now we've just got to wait on his little earlobe to heal. The doctor also put tubes in his ears to keep his ears free of any fluid. When Brady was born in Conway, the hospital gave him a hearing test. Brady passed his right ear, but failed his left ear. We later found that he had a slight hearing loss in his left ear. Dr. Bower told us Brady should live a perfectly normal life, since he has 100% hearing in his right ear. He said the hearing loss in Brady's left ear is mild, and it shouldn't cause him any trouble. He went on to say his right ear would compensate for the loss in his left ear. Dr. Bower said he would continue to test Brady's ears to monitor his hearing. Brady failed his next two hearing tests miserably (over a six month period). Both times, he had fluid in his ears, which didn't help matters. On one hearing test, Brady was sleepy, irritable, and uncooperative. The other test, we could tell Brady was distracted and not interested in cooperating. The doctor then surmised from the hearing test results that Brady probably needed hearing aids. Paul and I couldn't have disagreed more. We told the doctor we saw no evidence of a hearing loss. However, Dr. Bower told us parents are not good judges when it comes to their child's hearing. When we told the doctor Brady's earlobe pit had gotten infected, he prescribed an antibiotic and scheduled the surgery. He told us he would also have an ABR done on Brady - which is a hearing test done only while a child is under anesthesia. This test takes behavior out of the equation. So Paul and I were excited that Brady was #1 - going to have the earlobe pit removed and #2 - Brady was going to have a hearing test that would accurately show us what he can or can't hear. The good news is the ABR test results showed what Dr. Bower had originally told us... that Brady has 100% hearing in his right ear and a slight hearing loss in his left ear. Dr. Bower said at this time, he doesn't see a need for Brady to wear a hearing aid. Whew, what a relief! We knew Brady's hearing was good, but it was great to see the test results prove what we believed all along. So, it's been a busy week and a half for us. How was your week? I share your sentiments. Last time I was on vacation, our entire family was stressed out about 75% of the time! Seems like there SHOULD be such thing as vacations but I honestly can't think of one I had that was relaxing - especially family vacations. Looks and sounds like a wonderful trip! What a great vacation. I love the beach! With regard to the seatbelt, I too don't like it hitting my neck or leaving marks on my cloths, I use a pinch type clothspin up at the roof of the car. The belt is totally in place, but not binding on me. Got this trick from my husband who also doesn't like it on his neck. Are we safe? Probably not, but it's the best it's going to be. Glad to hear your son's hearing is going to be okay. My cousin and I are both truckers. He always wears his seatbelt that way, and I never wear mine. Last week he got a ticket in Indiana for the same thing on the turnpike. He was pretty ticked off too, being as he always wears his and I never wear mine and have never received a ticket. I had to learn that when on vacation it is best to have a day where you don't visit the sites and just rest. Imee - Hehehe! Isn't that the way it always goes? Seems like after every vacation, I have to come home to rest. Paul Maurice Martin - Ooh so true. Some of my favorite vacations are when I stay home and have no agenda. Lisa - It was a great vacation. I sure miss spending time on the beach. Siteseer - It was a lot of fun. Hmmm... a clothspin huh? Interesting! I know you can buy those things that make a seatbelt more comfortable to wear. I need to find one for my husband. Yes, I too am thrilled about Brady's hearing. I just confirmed what my husband and I both knew in our hearts. Steve - :) That's funny. I feel sorry for your cousin, though.